Dr. Karen Mapp is a senior lecturer on education at the Harvard Graduate School of Education (HGSE) and the faculty director of the Education Policy and Management master’s program. For the past two decades, Dr. Mapp has focused on the cultivation of partnerships among families, community members, and educators that support student achievement and school improvement. At HGSE, she has served as the co-coordinator of the Community Organizing and School Reform Research Project and as a faculty member in the Doctorate in Educational Leadership Program. 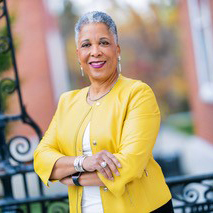 Prior to joining HGSE, Dr. Mapp was the deputy superintendent for family and community engagement for Boston Public Schools and was also president of the Institute for Responsive Education. She has written and co-authored several articles and books about the role of families and community members in student achievement and school improvement, including Beyond the Bake Sale: The Essential Guide to Family-School Partnerships. Dr. Mapp is a member of the Board for the Institute for Educational Leadership, a founding member of the District Leaders Network on Family and Community Engagement, a trustee of the Hyams Foundation in Boston, and serves as a consultant on family engagement to the U.S Department of Education. I was recruited to become an EPFP Fellow when I was at the Institute for Responsive Education because of the school, families, and community partnerships work I was doing there. I had no policy experience except what I had learned during graduate school so I thought EPFP would be a good opportunity to meet people on the political side of the spectrum. Our speakers were great; we got to hear from former Massachusetts Gov. Michael Dukakis and learned a lot from him about the real policy process and how important it was to build relationships with people and constituents. I felt like EPFP gave me exposure to all sides of the policy process—not just the glamorous part, but also the hard work, focus, and intentionality across all players to move the process along. What I didn’t like at the time but now realize is how slow the policy process is; it’s full of push, pull, and compromise. I also really enjoyed my time spent in Washington, DC, for the Washington Policy Seminar. I had the opportunity to talk to some of Sen. Ted Kennedy’s staffers and sat in on a congressional hearing, which really exposed us to what this work means and what it requires. EPFP has come a long way from when I was a Fellow. I participated in a panel for the Massachusetts cohort and was very impressed with the sophistication of the questions Fellows asked. They are getting even deeper exposure to what it takes to move the work, not just in terms of being a policy leader but being a leader at large in their sector and related sectors. EPFP helps Fellows see the world through an education lens and build a network of fantastic people working at all levels in education—something you might not be able to do through your job alone. If we want effective partnerships between home and school, then both sides need to have opportunities to build the capacity to partner with each other. That has been a hot topic for many districts and states—and even the federal government. Often the focus has been on “fixing families” and creating interventions that try to get families to value education and support their kids’ learning. But the important thing is for schools to engage families; you have to build the capacity of teachers and staff to engage families in their work. And this realization is continuing to grow. Ten or so years ago there were few people in my role, which is working with superintendents on family engagement. Now our District Leaders Network has more than 130 members and is continuing to grow, which is an indicator that people are realizing how important this work is. I’m more optimistic now than I have been in quite a while about the growing interest in this area of work. I’m very hopeful about the opportunities for relationships between families and schools and districts, in part because of IEL’s support. We’ve seen the growth of the District Leaders Network and especially the Family and Community Engagement Conference. I also held a family and community engagement institute at HGSE this summer and, because of its success, we will be expanding it from 2 ½ to 4 days with more than 150 people already on board. I get a lot of calls from districts and state leaders who are slowly but surely understanding that family and community engagement is the missing link in their school improvement efforts. Sec. Duncan has also talked a lot about the importance of family engagement. This is the type of thing that will help this work move forward. It will never be totally complete and there’s still a lot of work to do, but we’re on the right track. Any work in the education sector requires multiple stakeholders to be engaged. In my experience as a deputy superintendent in Boston and doing research on family, school, and community partnerships, I’ve learned that the best initiatives that are sustainable and have high ownership are ones where stakeholders get together, think about a problem, create solutions, and execute together. It doesn’t work when we try to attack a challenge in silos; often we spend more time correcting misunderstandings rather than focusing on kids. Because education is everyone’s business, you have to be a boundary crosser in order to be successful. You can’t do this work unless you understand and situate yourself in the space where different people’s perspectives are. People are often not taught the importance of cross-sector work. I once heard a superintendent say that they are trying to concentrate on what they have control over, which is only the classroom. I think that is a narrow perspective because children spend a lot of time in their communities and with their families. If you only think you’re concerned about one small piece and don’t see how all of the pieces connect together, you haven’t engaged the stakeholders you need in order to succeed. It’s understandable that this might sound overwhelming, but in my work, I try to show that working across boundaries actually makes your work easier. It may require an initial investment but once you make those connections and have a network of support, it makes your work much easier and more enjoyable. The relationship piece has been huge for my work. I still don’t think people understand the importance of building relationships; they’re the glue that holds everything else together. People often think relationship building is touchy-feely and simply an accessory to the work of successful districts and educators, but I know from my experience that it’s the central factor to the success of the work that we do.